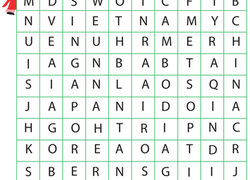 Celebrate the rich variety of Asian and Pacific Islander cultures and their peoples with these Asian Pacific Heritage Month worksheets. Featuring traditional dress and folktale coloring pages, as well as short biographies about famous people from many countries, these printables help students around the world learn about these cultures and celebrate diversity every May. For more seasonal learning, check out our collection of Spring worksheets. One thing every culture has in common is a set of folk tales and myths. Check out a little bit of kappa myth with this coloring page. Jeremy Lin is a basketball sensation and the very first American-born NBA player of Chinese heritage. Can't keep your kid off the ice? Hand her this coloring page of figure-skating hero Michelle Kwan, one of the most accomplished figure skaters in history. This xiezhi coloring page is a great tool for kids learning about figures from folk tales from around the world. Try this xiezhi coloring page with your child. If your kid can't get enough of baseball, introduce him to star player and important barrier-breaker, Ichiro Suzuki. Larry Shinoda is an influential car designer who brought some of the most iconic cars of the 20th century to life. Maya Lin is best known for designing the Vietnam Veteran's Memorial while still a college student, but has also designed buildings, sculptures, and art. Hawaiians might already know this famous name: Duke Kahanamoku, one of the most accomplished athletes in history and a pioneer of the sport of surfing. Celebrate Asian Pacific American Heritage Month by coloring in this picture of famed athlete Apolo Anton Ohno, or by printing out the entire series! Few politicians are as inspirational as Dan Inouye, the highest-ranking Asian-American politician in the U.S.! Can't keep your kid off the ice? Hand her this coloring page of figure-skating hero Kristi Yamaguchi, one of the most accomplished figure skaters in the world. Meet one man whose influence is all around us: I.M. Pei, one of the most celebrated architects of the 20th century.